Should you ever decide to do a long drive across America you may want to try the road less traveled. In summer of 2017 I had to go to Nebraska for my National Rollerskating Championship. We drove there on I-80 but on the way home we decided to take US Route 50 to come home. US Route 50 is known as the loneliest road in America and it also know for being the Pony Express Trail. We drove throughout the night and shortly after sunrise we saw all kinds of interesting things on this lonely stretch of highway. We saw a shoe tree, salt flats and then all of out of now where this giant sand dune popped out of no where? After doing some research I found it it’s called Sand Mountain located near Fallon, Nevada. The sand originates from the ancient Lake Lahontan, that for the most part dried up 9,000 years ago. 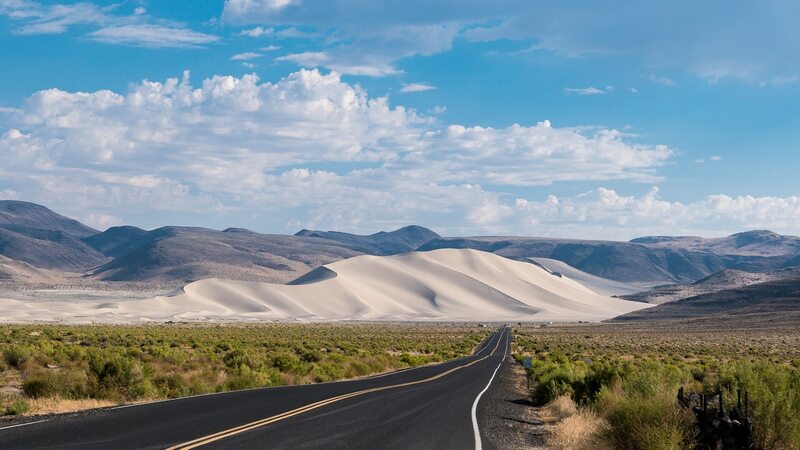 Sand Mountain is a recreational area so you can ride off highway vehicle as well as hike up the dunes. While we didn’t stop to do anything there, we have made this on our list to go back and check out in detail. The recreation area also includes the Sand Springs Pony Express Station historical site so if you’re into history there is plenty of it around here. The area is managed by the Bureau of Land Management so if you plan to make a trip there, you may want to check out there website for pass information and other guidelines. https://www.blm.gov/visit/sand-mountain-recreation-area.